Changing the prescription in your eyeglasses may improve vision in the early stages of cataracts. If this measure doesn´t help, cataract surgery is the only effective treatment. 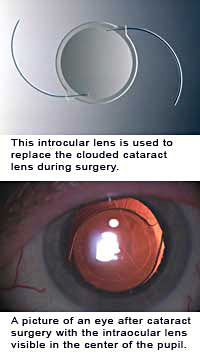 Cataract surgery involves removing the cloudy lens and replacing it with a special intraocular lens. This special lens requires no care and becomes a permanent part of your eye. 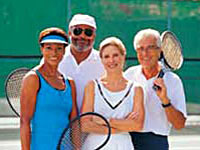 Cataract surgery is one of the most common operations performed in the U.S. today. It is also one of the safest and most effective. After surgery most patients can drive a car and read the newspaper without glasses. What is "No-Stitch" Cataract Surgery? Dr. Brems performs a special "No-Stitch" cataract surgery. It is the most advanced surgical treatment for cataracts available anywhere and the actual procedure usually takes between four to seven minutes. The surgery is done with special instruments that are smaller than the tip of a pencil. Drops are used to numb the eye during surgery and we give relaxing medicines to make you feel comfortable. The surgery is all done through a tiny opening in the eye. With the special instrument the old clouded cataract lens is removed in little pieces about the size of a grain of sand. Once the cataract has been removed the intraocular lens squeezes through the small opening in the eye and opens up once inside. Flexible loops on the intraocular lens open and hold the lens in place. With a clear lens now back in the eye the vision is restored back to normal. Intraocular lenses come in different powers and we are able to correct your nearsightedness and farsightedness by selecting just the right power. The surgery is called "No-Stitch" because the tiny instrument are so small that no stitches are required. The advantages of "No-Stitch" are: faster recovery, shorter surgery time, and better vision. Dr. Brems´ patients return to normal activities, without a patch, just hours after surgery. Most report they can go out to lunch after surgery.